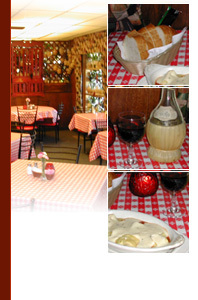 Luigi's Homemade Italian Food Since 1958! The driest style of sparkling wines, yet perfectly balanced. A smooth vanilla and apple-flavored bubbly with a sweet, creamy finish. Sonoma Chardonnay. Intense fruit; nectarine and peach flavors. An elegant, fresh and fruit filled dry wine. An exquisitely rich, dry chianti. Elegant and rich with a beautiful bouquet. This Chianti comes from the Classico region. Round, subtle, elegant taste typical of a full-bodied Riserva Chianti. Light wine, easy to drink, in the Fiasco bottle. Soft and supple berry fruit; full flavored. A light, dry Italian red wine; perfect with pasta. Sangiovese, cabernet, merlot blend; medium bodied, tasty Italian red! Italy's most famous sweet red wine. Rich, full, berry and oak flavors. Medium bodied, smooth; ripe plum, blackberry, black cherry flavors. Fruit forward style; lush , ripe fruit flavors--cherry, blackberry, mocha, clove. available in litre, 1/2 litre, or glass.